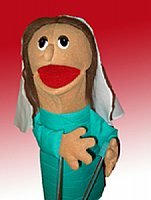 Biblical Girl PuppetÂ 14-16"Â with brown hair, wearing biblical clothes and headdress. She is perfect for acting out Bible stories or for any play calling for a Bible character. Clothing fabrics may vary. One of the "Biblical-Time" line of puppets. They are designed for use by children, beginning puppeteers or in classroom settings. This line of puppets has soft, pliable mouths large enough for adult hands. Made of foam-backed velour tricot fabric, they have poly-filled heads, arms and hands. Biblical-Time puppets are flame retardant, meet U.S. child safety standards, and are hand washable. Acrylic arm rods with velcro attachments are included.